A few days ago, we spotted AMD's upcoming Ryzen 7 2700X processor at the 3DMark playground. 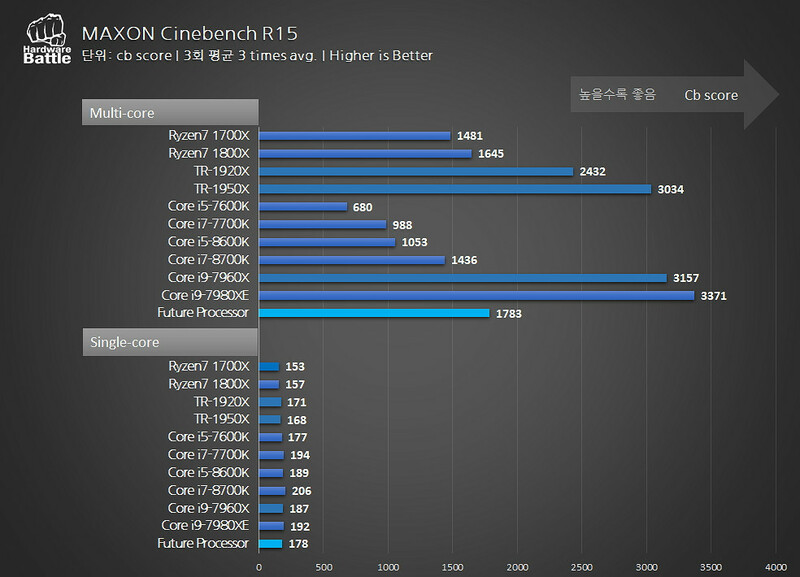 We got word today that our Korean buddies over at the Hardware Battle forums have leaked some benchmarks of a mysterious Ryzen 7 2000 processor. 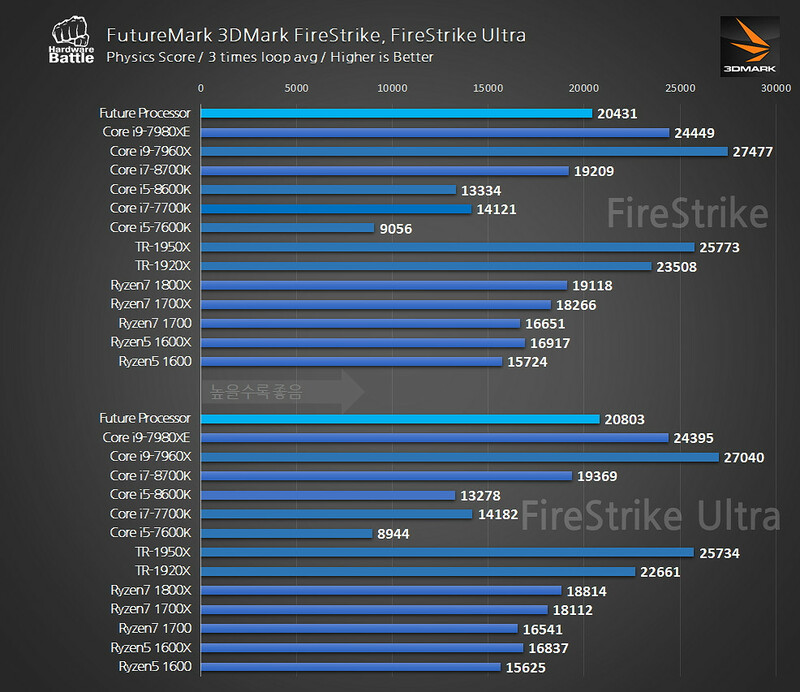 While the graphs don't explicitly state the model of the so-called "Future Processor", it's very likely that it's the Ryzen 7 2700X. 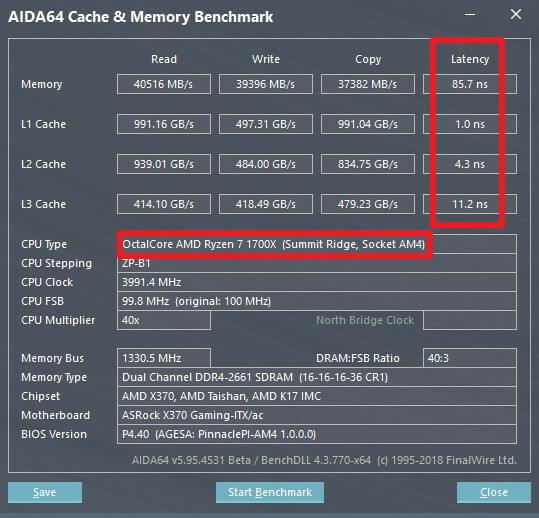 First off, the clock speed matched the specifications from the previous 3DMark leak. HWBattle also compared it to the Ryzen 7 1700X numerous times which makes perfect sense considering that the Ryzen 7 2700X is the next successor to the throne. Initially, we projected the Ryzen 7 2700X to hit the 4.2 GHz mark thanks to AMD's XFR 2.0 (eXtended Frequency Range) and Precision Boost 2.0 technologies. 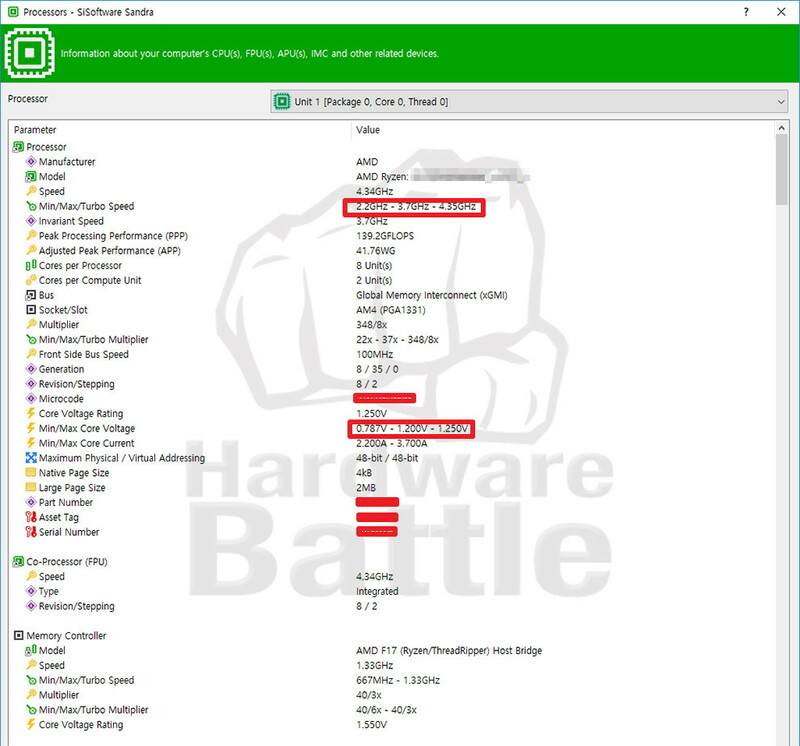 However, HWBattle's sample reached 4.35 GHz which makes it even more impressive. Comparing the Ryzen 7 1700X and 2700X side by side in AIDA64's memory benchmark, the latter was 11% faster in the memory latency test and 30% and 16% faster in the L2 and L3 Cache tests, respectively. The Ryzen 7 2700X's single thread performance was surprisingly strong as well. It surpassed the likes of the Intel Core i9-7980XE, i7-8700K, and Threadripper 1950X processors in the Dhrystone Aggregated-int Native benchmark. The Ryzen 7 2700X started to fall behind in multi-core performance, but it still managed to beat the Intel Core i7-8700K. We saw a similar scenario with the Physics test in 3DMark's FireStrike Ultra benchmark. The Ryzen 7 2700X once again annihilated the Intel Core i7-8700K. Interesting, sounds like they have made some decent improvements all around on this chip. If they support faster RAM speed as well they’ll reduce the latency even further. I'm impressed. Looks like they've improved their chip interconnect technology. No gaming tests? From what I recall, the 2xxx series is only seeing some of the improvements that AMD had planned for Ryzen—they just ran out of time for their original launch deadline. “Zen 2” should be even better. It sure is nice to see AMD with an architecture that has a future again. We saw a similar scenario with the Physics test in 3DMark's FireStrike Ultra benchmark. The Ryzen 7 2700X once again annihilated the Intel Core i7-8700K. Considering the Ryzen chip is using the same (or less) energy than the 8700K, and it is also scoring higher... Yeah I would also call that annihilation. Especially if you consider that this is like the only thing Intel can even cling to anymore as an example of them beating Ryzen. Besides it runs much cooler then Kabylake or Coffeelake. Ryzen does not hit thermal wall like intel processors unless delided. I think you are not reading my whole post. The Ryzen chip is using less energy, so in fact no one should care if Intel performs a little better. Also - 1080p gaming is pretty much the only advantage Intel has left anymore. If they lose that, they have no logical reason for people to buy their chip over AMD. So first gen Ryzen could be considered as AMD's test run of its new architecture, in addition to being Intel's wake up call. So it seems the 2000 series just might be the real deal now that the early creases relating to the uncore have been ironed out. 1080p gaming is pretty much the only advantage Intel has left anymore. AMD needs to focus on that because there's many of us who are still playing at 1080p because 4K is still too expensive to adopt. Intel's strong point is clock speed, which enables much higher single thread performance, thus enabling what you said (in bold). From what i understand, Zen's IPC @ same clocks VS coffee lake is just a bit behind in single thread performance. Zen then almost catches up in multi-thread due to SMT being superior to HT. But, because coffee lake's frequency is so much higher, it gives the illusion that the difference is much higher then it actually is. As such, this increase in 2700x (assuming it is this processor and that these results are correct), will make AMD catch up to Intel: still not enough in more single threaded scenarios but enough to overtake in more multi-threaded scenarios. Well I'm going to wait for the release and tests afterwards. Switching from my good ol' 3770k to a Ryzen would have been a huge improvement :) I'm looking forwards for this release. BTW: Wonder if we'll see same price to performance ratio as with the 1000x's series Ryzens. Given the mess with 1800x, 2800x shouldn't exist or at least have 10 cores to justify for the $500 price tag. Looks very promising, while everyone is hung up on the single core performance, I think this will be my workhorse. But not before 1 month after it's released, and has been extensively tested. above is speculation but it opens up for it but regardless of the clocks it will still lack in IPC somewhat by some minor amount but a Ryzen at 4.4 ghz with 1-2% less ipc vs 8700K @ 4.7-5ghz is not going to compete in games as usual. But the surprising thing to me is that Latencies is improved quite a lot and should improve gaming performance a lot more than any other benchmark, with slightly higher than expected clocks and hopefully memory compability should make this launch very interesting indeed. It will not be playing with an 8700K in games still me thinks, for me good enough. IDK at this point on core/threads as long as performance is there and efficiency is good... 8/16 still ahead 6/12 and Ryzen cuts through most M/C jobs like soft butter. Interestingly you can get a 1800X for $300 at Micro Center. Amazon/Egg $360. So we'll see how AMD has to price a 2800X against the i7 8700k that are $340_Egg; $333_Amazon; $330_Micro Center, and some can be found as low as $300. Though I think the 2700X will be right on heels the i7 8700k and MSRP for $280-270. 1080p is and will remain the most used resolution according to steam, due to gpu pricing aswell. Also 240hz is a thing, like pubg, fortnite, cs etc... Majority of pc gaming. 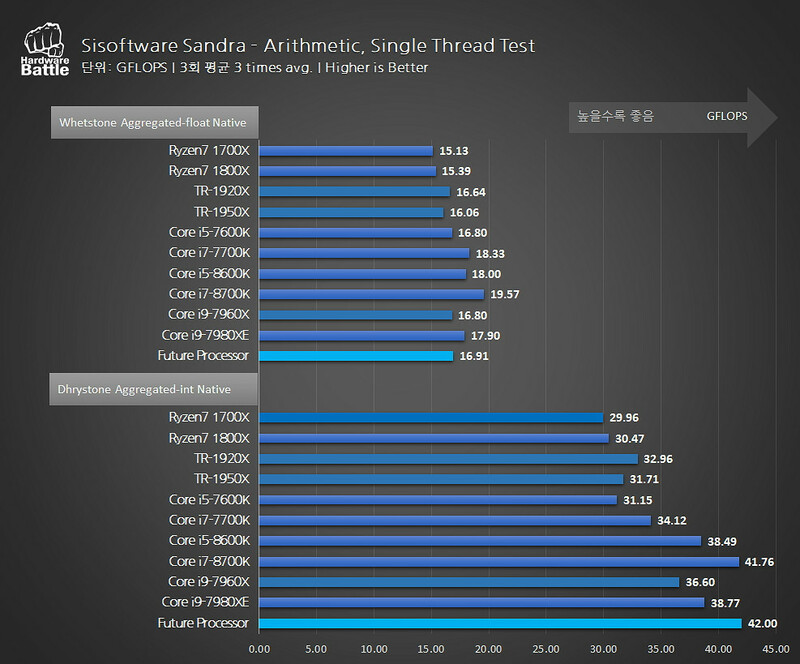 You guys are surprised because a 8c/16t beats a 6c/12t by 5% on a multi threaded test. Nice. I will wait for proper benchmarks as imi 6c/12t with a good single core performancr and ipc is more benefical for majority. I've been very pleased with my 1500X @ 3.9, planning to build a 2800X opensuse Tumbleweed box, and I'd be happy with 4.0 on all cores if I can get that. 4.2+ would be icing on the cake, but I don't think I'm really going to notice a difference. Are these results with/without Spectre/Meltdown protection on/off. I wonder what other "in-house benchmarking" tweaks can be done to the microcode (e.g. skip all housekeeping, reconfigure L1/L2/L3 cache for max single thread performance, later, switch to max multi-thread performance) to improve benchmark scores to get more heat into early PR interest. A bit like VW diesel engines. Synthetic "monitored" performance radically different to real world on-the-road behaviour? I'm not knocking this specific CPU, just becoming increasingly cynical about what's going on in the R&D labs. I think people have become so accustomed to AMD being behind the mark, that when they see something else outside the norm their mind kind of panics. Secondly... the people arguing at the beginning of this thread about what represents annihilation and what doesn't... I really got a laugh out of that. So thank you.